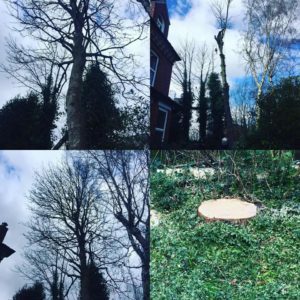 Our tree surgery provision covers all of Cheshire and Manchester. We have built up a reputation based around the high levels of customer care and providing an excellent service. In our line of work it is vital to invest in specialist equipment and to build a plan based around the individual requirements of any particular job. This project we completed in Heaton Moor was a perfect example of this. We completed a Sycamore Section Fell. The Sycamore tree has become very large and problematic. When viewing the work of tree surgeons, you are often faced with the real thought of how dangerous our trade is. Both the heights and the machinery we use can cause serious injury and just a moment’s distraction can be the cause of that. It is therefore vital that anyone completing the job has the required knowledge and expertise. It is true to say that not everyone could face the heights to which we work at. This work is not for the faint-hearted! As discussed above, a plan was formulated in order to complete the section fell based on the tree’s surroundings and the way in which we knew it would be best felled. As each branch is removed, consideration is taken into the safe removal in terms of people and surrounding properties. Have you got a question about the process of felling trees? Or the services we offer? We aim to answer questions and queries as soon as possible. Feel free to make contact with us via landline 0161 483 7816 or mobile 07855 859983. Is your Garden in Unnecessary Shade? With the sunny weather, it may just be that spending more time in your garden that you have noticed your trees have grown. These may be causing unwanted shade in your garden. Try not to miss the opportunity of enjoying the sunshine; our pricing is competitive and comes with our promise of brilliant customer service.